The 2012 Atlantic hurricane season formally comes to a close today. Contrary to early predictions, it was an extremely active season with nineteen named storms. As the third consecutive year with that number, 2012 tied the record for the third busiest hurricane season in American history. In spite of all this action, however, only four storms made landfall in the United States: Beryl, Debby, Isaac, and Sandy. The season, which officially runs from June 1st to November 30th, got off to an early start this year with two storms, Alberto and Beryl, arriving in May. Another early highlight was Debby. Forming in June, it was the earliest arrival of any “D” storm in history. After a lull in July, the season roared back into action with eight storms in August, including Isaac. The most memorable storm of the year, however, was Sandy in late October. Measuring nearly 1000 miles in diameter, it was the largest hurricane ever recorded. While none of these landfalling storms were rated higher than category-2 on the Saffir–Simpson scale, their impacts were nonetheless devastating. Claiming the lives of more than three hundred people and causing tens of billions of dollars in damage, this hurricane season will not be forgotten any time soon. Hurricane season officially comes to a close later this week. The season for nor’easters, however, has only just begun and typically runs through April. A nor’easter is an intense type of winter storm that traditionally affects the east coast of the United States from the mid-Atlantic to New England. Given the name, you would think a nor’easter comes from the northeast. The opposite, however, is true. These storms develop when a strong area of low pressure to the south moves up the east coast and meets cold air pushing down from Canada. They are infamous for producing powerful winds, heavy rain, snow, and coastal storm surges. The steady northeasterly wind that blows in from the ocean ahead of these storms is what gives this weather pattern its name. 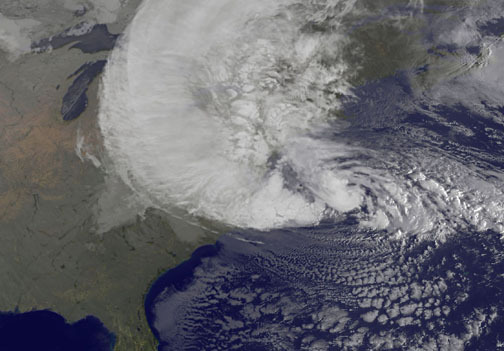 Forecasters predicted Sandy would be a serious storm – and it was. Its storm surge, however, was higher and even more catastrophic than had been anticipated. The New York Times, earlier this week, published an interactive map of the flooding caused by the super-storm in New York City. It is an incredibly detailed visualization of how high the floodwaters actually reached in different parts of the city. Two weeks ago, Super-Storm Sandy blasted New York City with high winds and a devastating storm surge. Since then, many parts of the Big Apple have been slowly returning to normal. Some of the city’s hardest hit neighborhoods, however, are still in recovery mode. In an effort to help my fellow New Yorkers, I recently delivered donations to the storm ravaged communities of Staten Island, NY. Seeing the destruction caused by Sandy first hand was overwhelming. So many homes were damaged or destroyed, huge amounts of debris were piled up in front yards, and some areas were still without power. For anyone wishing to help in the ongoing storm recovery process, please visit these websites for more information: NYC Service, Mayor’s Fund to Advance NYC, American Red Cross. 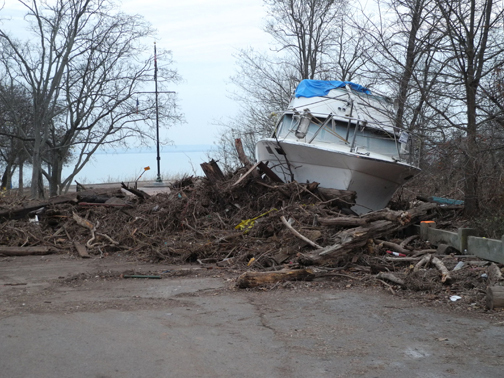 A boat and debris washed ashore in Lemon Creek Park on Staten Island, NY by Super-Storm Sandy. Super-storm Sandy slammed New York City this October. Its powerful winds and flooding storm surge devastated the metro-area. In terms of precipitation, however, it only produced 0.95 inches of rain locally. This brought the city’s monthly rainfall total up to a mere 2.92 inches. That is 1.48 inches below normal. Bouncing up and down throughout the month, temperatures in the city felt like they were on a roller-coaster. As we are transitioning from summer to winter, however, this is not unusual. In the end, NYC finished the month with an average temperature of 58.1°F, which is 1.1°F above normal. While this may not seem exceptionally warm, it is interesting to note that the city’s average monthly temperature has been above normal for nine of the last ten months. Sandy, the 18th named storm of this Atlantic Hurricane Season, made landfall near Atlantic City, NJ late Monday. Measuring nearly 1000 miles in diameter, the effects of this massive storm were felt up and down the Eastern Seaboard and as far inland as the Great Lakes. The brunt of the storm, however, was focused in the northeast. According to the National Weather Service, Sandy was a category-1 hurricane that transitioned to a post-tropical storm just prior to coming ashore. Despite this technical downgrade in status, the storm maintained hurricane force winds and packed a devastating punch. It toppled trees and produced a record storm surge of 13.88 feet that caused significant property damage, extensive power outages, and a mounting death toll throughout the region. The hardest hit areas include the densely populated shoreline communities of New Jersey and nearby New York City. Hurricanes in the northeastern United States are not unheard of, but are generally few and far between. They typically dissipate over the cool waters of the mid-Atlantic and move out to sea. Sandy, however, was an exceptional event. Energized by unseasonably warm ocean temperatures, this storm traveled north from the Caribbean, parallel to the US coastline. A large area of high pressure over Greenland, however, soon forced it to make a hard left turn. This shift inland put Sandy on track to meet a cold front moving in from the west. Merging together to form a hybrid nor’easter-hurricane, this colossal and catastrophic weather event earned the title, Super-Storm. The damage caused by Sandy is currently estimated at $50-billion.